How are you all? Hope you've had a lovely holiday! Well 2013 has been a tiring year, the most stressful year yet and I'm sure 2014 won't get any lighter. As always the year goes past so quickly, it's scary. I'm probably going to have suicidal thoughts when it's the exam season in 5 months time. Anyway, I have gone for another all black outfit, as you may have guessed from the title of "Direwolves", I am a fan of Game of Thrones (although I have yet to read the books). 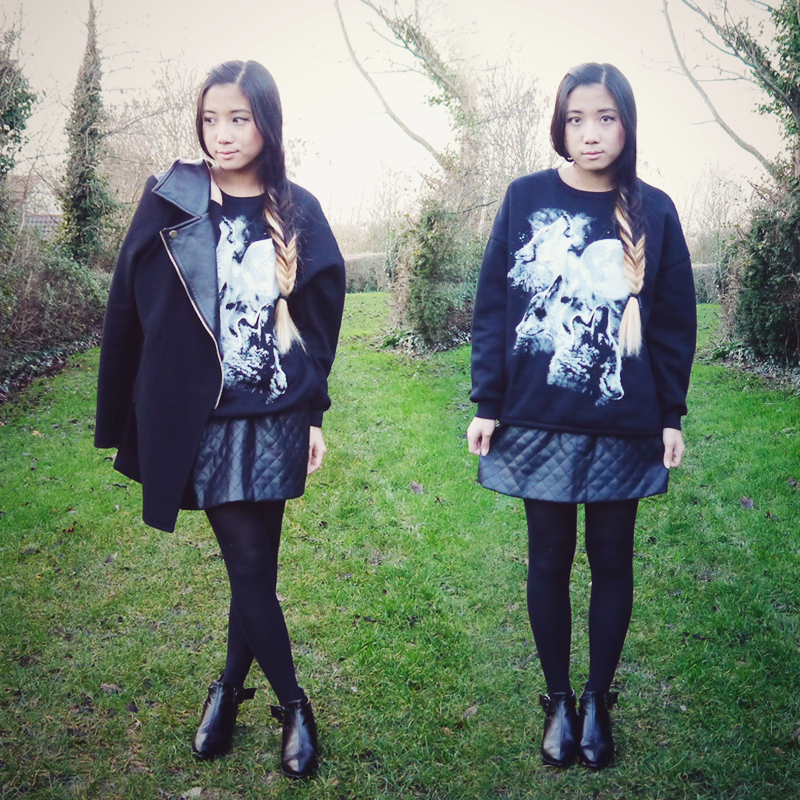 So when I saw this printed sweater online I immediately claimed it as mine. The sweater is so soft and lovely, the fleece material on the inside along with the thickness of the fabric make this the most perfect sweater this winter! I originally tucked the sweater into the skirt but it made me look bulkier than I already look in this sweater. So I decided to go for the 'sweater over skirt' look for the first time, it feels so comfortable I must admit. Also, I have actually done something with my hair other than to let it sit there boringly. 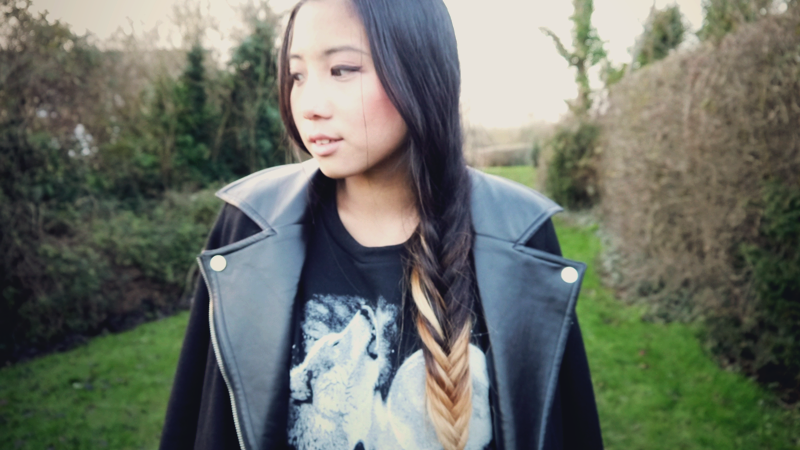 I love the way the blonde and black creates sections with this fishtail plait, definitely will be sporting this hairstyle more often next year! It's freezing outside and all I ever want to wear in this weather is some nice, comfy and snugly clothes that will make me feel 100% relaxed. 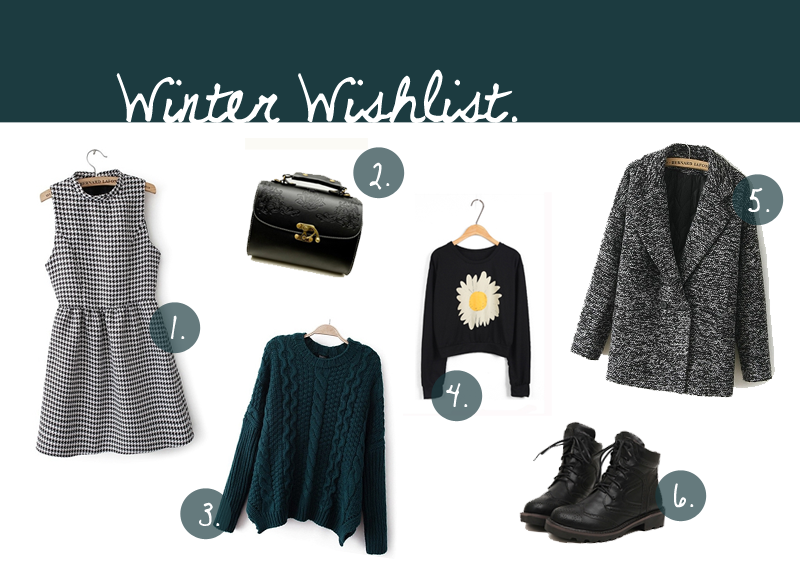 I have made a wishlist with a few item of clothings from Persunmall that I would love to wear this winter! Houndstooth has to be one of my favourite patterns, it looks clean and elegant which is great for dressing for both formal and casual occasions. This little square satchel caught my eyes with the delicate embossed detail, I was also attracted to the metal hook clasp which is rare to find on bags! The big sunflower print on the front makes a bold statement, it's adds a slight touch of cuteness to the outfit. A woollen coat will definitely keep you warm from the harsh wind outdoor! Grey is a colour that goes with anything so you won't have to pull your hair out when pairing it. Boots are to keep your feet warm, what more can I say? Just stack up your knee high socks and out you go to play in the snow. I hope you liked these items! Hello m'lovlies! So Christmas is only a few days away (Ahh it's so soon!) 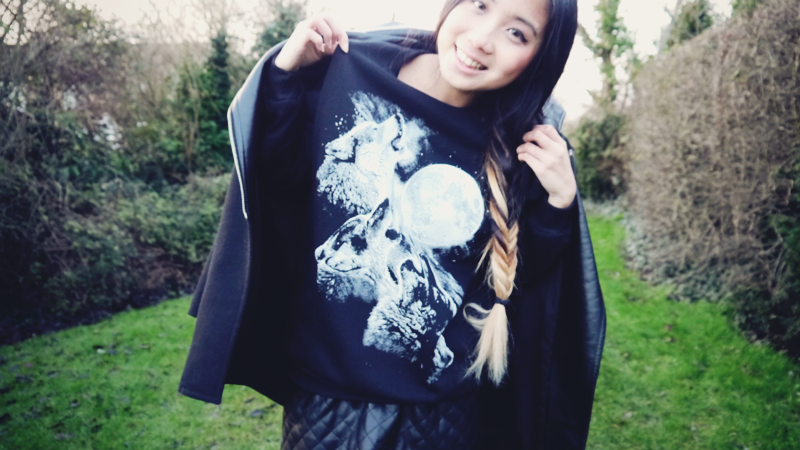 and so I have a fab giveaway for you! 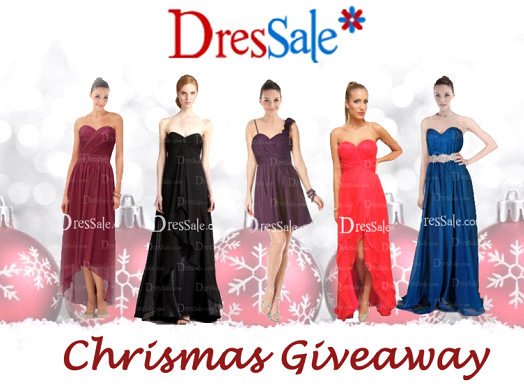 Dressale has some of the most beautiful and on-trend dresses, shoes, jewellery and more! 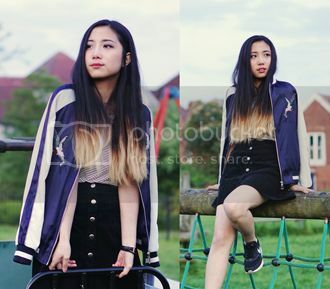 Don't you just love having a best friend who studies photography, this is another outfit that Ella (twitter) shot at the same location (and the same day) as my previous post. I really really am going to hate it when I go back to using self timer! I have a little confession to make... I actually used Photoshop to get rid of a couple of very very very visible spots on my face, if it makes me feel more confident, why not? 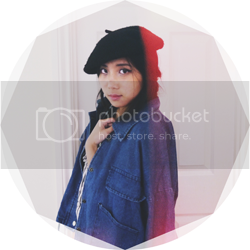 (But yeah my face isn't that flawless ha ha ha concealer doesn't do half as good of a job as Photoshop.) 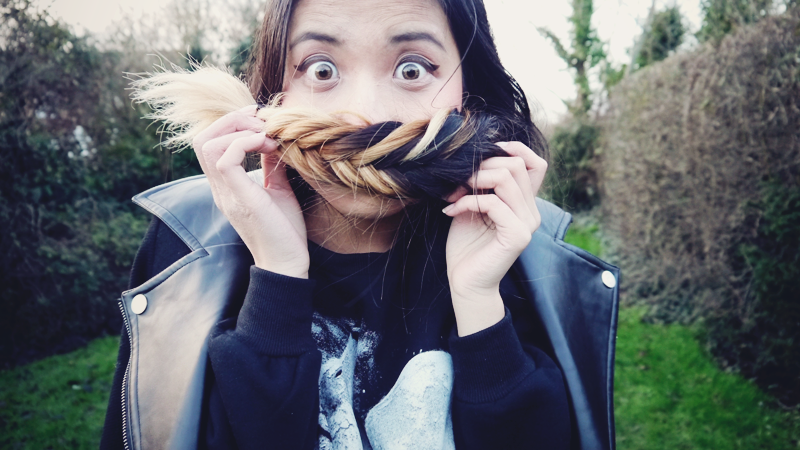 My hair really stands out in the photo, I rather adore the contrast. Surprising I have managed to hide that from my parents for over a week already... wonder how much longer I can pull it off for hmm. 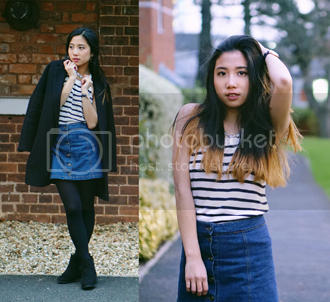 It has been over a month since my last outfit blog post. A lot has happened in the past month, I have applied for university, completed my first ever dissertation and also I have turned 18! It doesn't feel that different being 18 years old, perhaps it's because I haven't experienced night life as an 18 year old yet, but I don't plan to do so anytime soon either. I only just realised, I have been running this blog for over a year as I still clearly remember my birthday post I did last year with pictures of me and my best friends. 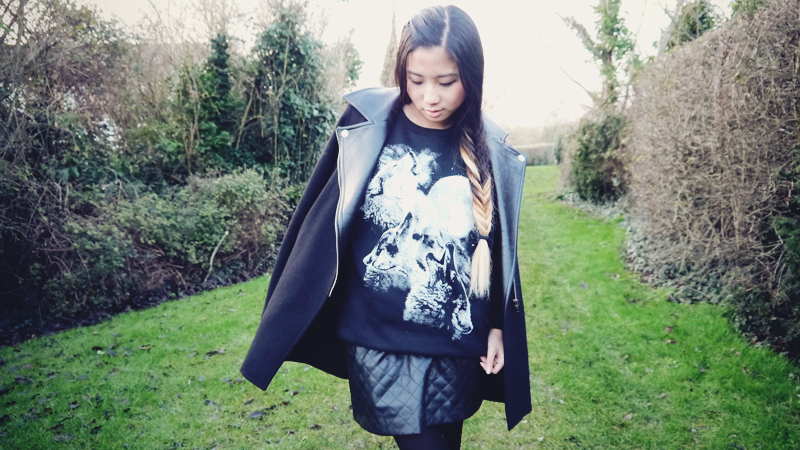 Anyway, this outfit post is taken by my awesome and talented friend Ella (twitter). It's about time I go outside for my outfit photos, saying that, I will probably end up using the self timer indoor again for my next outfit post because it's always hard to find time to arrange meet ups nowadays we both have college and work. This dress was actually longer than I had expected, it hits me right on the knees. I didn't particularly liked that so I think I will alter it when I have more time to spare. 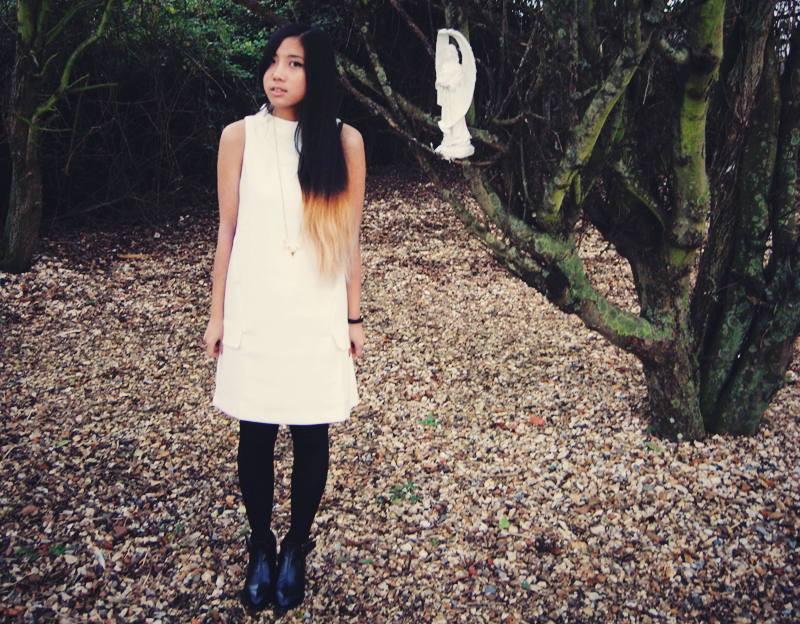 I do adore the simplicity of the dress though and the half turtle-neck stood out to me. 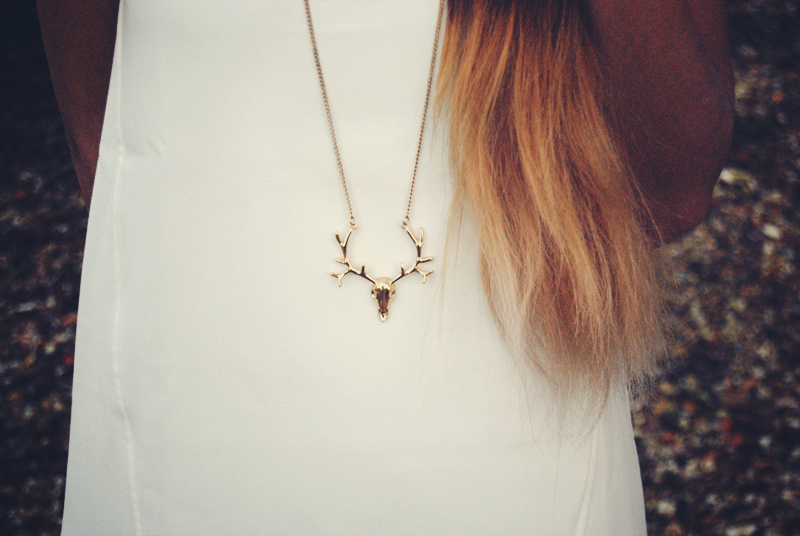 I decided to accessorize this plain dress with a gold long chained deer head necklace, it's so delicate and it matches with my new bleached hair! Unfortunately I forgot to take a close up photo of the boots I was wearing, but they have these really cool cut out with a golden metal plate on the heels! Hey y'all, this is my first ever haul and I wanted to share with you my thoughts on some of the clothes I have for this Autumn/Winter! All information about the giveaway is in the video and the description box, so make sure you watch it till the very end!